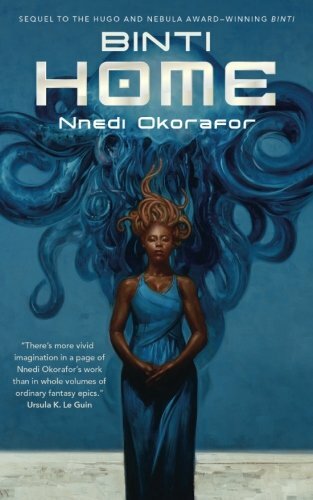 Nnedi Okorafor follows up her Hugo and Nebula award winning book Binti with a sequel, Binti: Home. Those who were enthralled by Binti and her complicated journey to Oomza University will thoroughly enjoy this book of her travels. Home is a fitting and satisfying next chapter. However, it isn't the physical journey that makes it an engaging read. What is the most compelling about this second novella is the exploration of Binti as a character, her past, her culture, and her interactions with her family. Home focuses on the struggle Binti faces between her new life at the university and as diplomat of the Meduse people, and her obligations to the Himba people and love for her family. In the first novella, Binti runs away on a star ship as the first of her tribe accepted to Oomza University, the most prestigious place of learning in the universe. Her sudden departure is a hardship on her family, but it also puts her family's business and Binti's status in her Himba community on shaky ground. Home explores the consequences of Binti running away and how it impacted her family, specifically her father, who had no one to take over the family business in his old age. Arriving home, Binti struggles to reconcile her happiness at Oomza Uni with her home life and soon realizes the impact zone of her choices is more than she expected. “No man wanted a girl who ran away. No man would marry me.” The anguish of Binti's exclusion from her culture and scorn from her family is just as powerful as the heavy external conflict in the first novella. Those wishing for the lightning fast pacing of the first book will be disappointed, but Home has a level of complex tension and conflict that is more emotionally engaging than thrilling. It would be impossible to discuss this book without reveling in how completely it casts off genre tropes. Specifically, Binti is a real life, vulnerable woman who is strong, proud, and complex. She is smart, brave and utterly, completely unique from other female protagonists. She isn't a “strong girl” trope that has plagued genre fiction for decades and is specifically totally overdone in science fiction. As with the first novella, Okorafor is skillful in packing an incredible amount of detail and depth into few words. The level of detail she gives to the Himba tribe and Binti's family creates a rich, three-dimensional feel that is difficult to pull off in a novella. The ending is an extreme cliffhanger, which was a bit unsatisfying. However, with such a sharp ending comes a promise of further volumes in the series and an incredibly promising career for Nnedi Okorafor. Catherine Grant is an author from Providence, RI. Her work has been published in Lamplight magazine, Shock Totem, and various anthologies.